A panel of local experts and Andrew Ross, author of “Bird on Fire,” will discuss the current state of sustainability in Phoenix at a public forum on Tuesday, January 17, 2012. 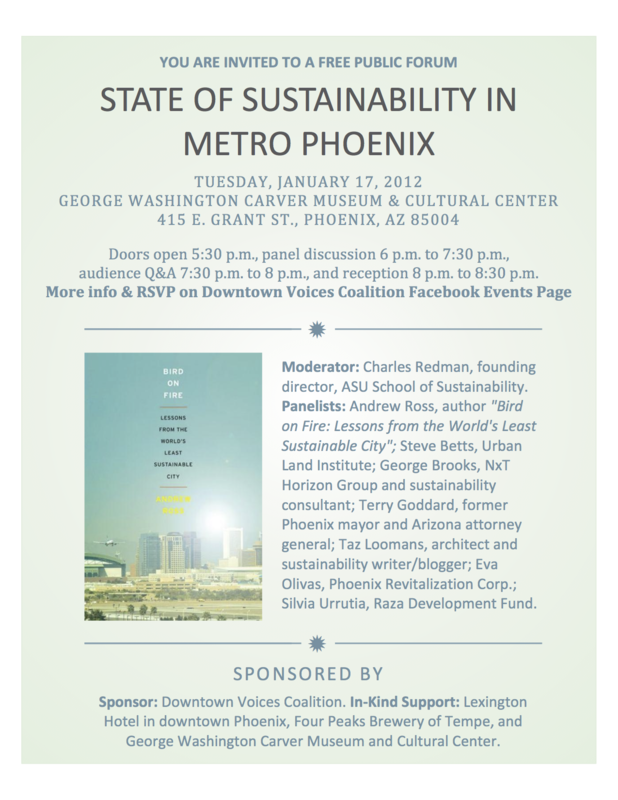 PHOENIX, Arizona – A panel of local experts and Andrew Ross, author of “Bird on Fire: Lessons from the World’s Least Sustainable City,” will discuss the current state of sustainability in metropolitan Phoenix at a public forum on Tuesday, January 17, 2012. The event, free to the public, will be held at the George Washington Carver Museum & Cultural Center at 415 E. Grant Street. Doors open at 5:30 p.m., panel discussion 6 p.m. to 7:30 p.m., audience Q&A 7:30 p.m. to 8 p.m., and reception with complimentary refreshments 8 p.m. to 8:30 p.m.
Andrew Ross, professor of Social and Cultural Analysis, New York University. The Downtown Voices Coalition is sponsoring the event with in-kind support from the Lexington Hotel in downtown Phoenix, Four Peaks Brewery of Tempe and the George Washington Carver Museum and Cultural Center. “Bird on Fire” is available at Made Art Boutique, 922 North 5th Street in downtown Phoenix and at Changing Hands Bookstore at 6428 South McClintock Drive in Tempe. It is also available at Burton Barr, Cesar Chavez and Mesquite Branch libraries in Phoenix. Downtown Voices Coalition is a coalition of stakeholder organizations that embrace growth in downtown Phoenix, but is mindful that healthy growth should be based upon existing downtown resources — the vibrancy of neighborhoods, the strength of the arts community, the uniqueness of historic properties, and the wonderful small businesses that dot downtown. For more information, visit downtownvoices.org.